Finally, any remnants of a drought have been shattered, at least near Vientiane. 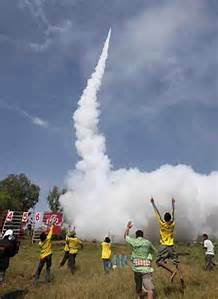 Just a few weeks ago, there were rocket festivals going on in various parts of the country, where rockets were fired off to summon rain from whatever spirits might be responsible for the weather. These homemade devices aren’t weak, either, with some of them able to take down low-flying aircraft. Local officials have to inform government authorities when the festivals are taking place so that they can warn the airlines and other aircraft to steer clear of the areas. After several days of often heavy and lengthy rainfalls, some folks (our neighbors, for example) are setting off bottle rockets and a few more powerful “bombs” to get the rain to let up. You just gotta be careful what you ask for. We had some of these heavy rains over the weekend, and they finally quit just as I was preparing to ride in to work this morning. I was a bit leery about riding on the back road, mostly dirt, thinking it would be a mud pit out to the main highway. It wasn’t as bad as I expected, but I did have to wend my way slowly and carefully in some places. I was too busy threading my way through the mud to notice how much the Mekong might have risen, but I’ll take a gander tomorrow. Cripes, it’s been hot here lately, at least over the last month or so. The maximum temperature is breaking records almost every day, though official record keeping goes back to only 1999. Daily highs have been ranging from 100 to 106 degrees (38-42 C.), while the average high this time of year is around 91 or 92. 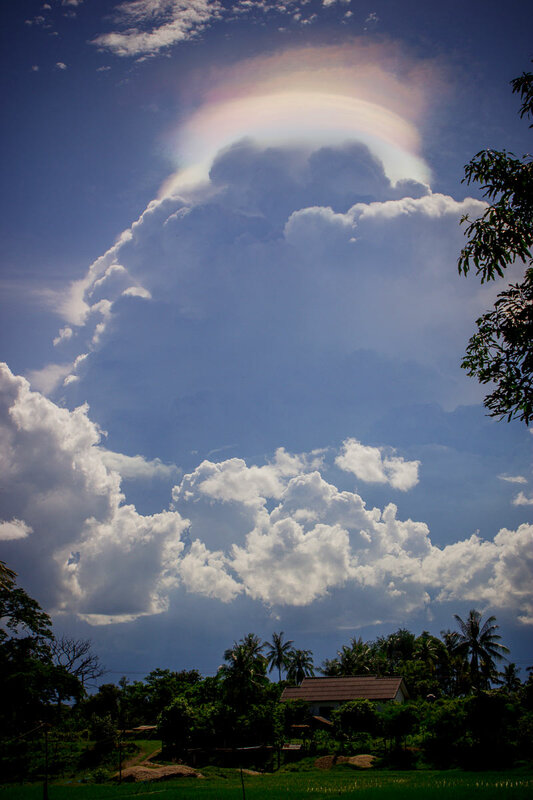 Here’s a Weather Underground blog entry about the extraordinary heat wave in this area of the world. We did get some heavy rain, winds and lightning this past Friday evening and the forecast is calling for a bit of rain over the weekend and into next week, so temperatures should drop a bit. However, due to the lack of advanced weather monitoring devices in the area, I take any forecast with a grain of salt. So often there has been a 100% chance of rain and . . . then, no rain at all. Or, the forecast calls for 0% or 5% and we get a deluge. Hopefully, we’ll get some more rain to relieve the heat and the ongoing drought that’s been deepening over the past few months. Here are a few more sunsets that we had over the past few days, and the sunrises are equally picturesque. The second photo shows some clouds in the evening sky, and, in fact, we finally had a bit of rain the day before the shot was taken. It was a very small amount, barely enough to dampen the ground out here, but Vientiane received quite a bit more, enough to create some large puddles. Any amount is welcome, of course. A nice sunset from last Sunday evening. Clouds! Rain! But not much. Another crimson sunset behind the temple across the road from the farm. The beautiful beginnings and ends of day aren’t without drawbacks, though. 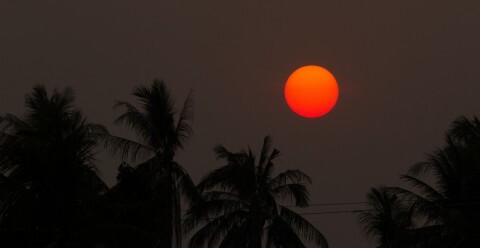 The sun is very red due to the haze in the atmosphere, which is mainly being caused by farmers burning the stubble off their fields in preparation for rainy season planting. I smelled smoke the other evening and stepped out onto the porch and noticed a heavy smoke cloud drifting in the fields near the house, caused by someone burning a nearby field, either across the river in Thailand or here not far from the house. Not pleasant at all. Hopefully, the burning will cease and the haze will clear soon. Smoke drifts over nearby fields not far from the house. Where there’s smoke there’s fire, but I couldn’t see where the smoke was coming from. Not a pleasant smell, and it just adds to the hazy skies. Lots of rain soon, please. As I posted previously, the Chinese are releasing water from a dam upstream from us to help out during the current drought. 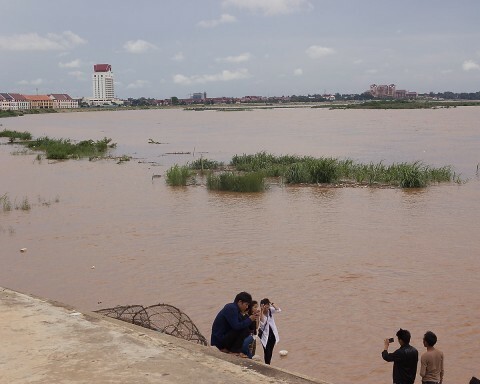 Riding into Vientiane today, I noticed that the Mekong had, indeed, risen about 3 to 4 inches. Just a wild guess, but the water level has gone up since last week. I hope that helps out the farmers downstream, especially the Vietnamese. I’ve put up a photo of a red sunset before, so here’s a somewhat similar red sunrise. Morning and evening, with all the haze in the atmosphere, we’ve had about a month of these colorful risings and settings. About the only time the sun casts dark shadows is when it reaches its zenith, around noon or so. The weather forecast is calling for a small chance of rain this Friday. Hopefully, we’ll get at least a few showers. 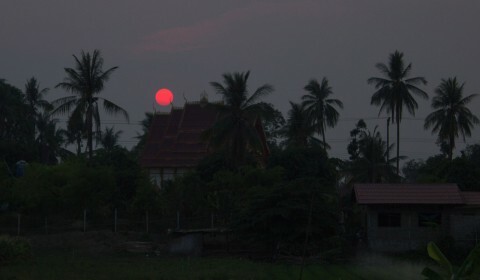 A red sun rises over Thailand and the Mekong River (unseen in this shot) from my front porch. March 19, 2016 / montanaron / Comments Off on Mekong Water War? It’s an interesting article that also goes into the regional drought and the record low level of the Mekong River. I rode my motorbike by the Mekong this morning on my way to work, but I forgot to check if the level had risen due to the release of water by the Chinese dam upstream, as I mentioned in my previous post. I’ll try to remember to check it out on my way home today. More later. 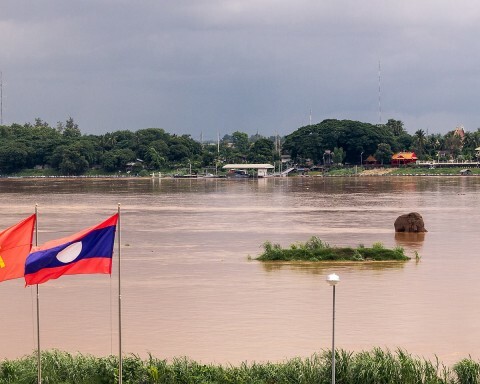 There was an article in the Vientiane Times today stating that an upstream dam in China will increase its water discharge to help alleviate the drought in countries lower down the Mekong River, specifically Laos, Myanmar, Thailand, Cambodia and Vietnam. We’ve got a fairly severe drought going on here in Laos, and the Mekong is at a very low level. However, Vietnam, according to the article, is suffering through its worst drought in 100 years. You can read the article here. There is a bit of history with this dam. Back in September of 2014, during a very rainy season in Southwest China, countries downstream from China were placed on high alert due to an increase in discharge rates from the dam that could flood large areas of those countries. I remember the warning, but, though the river rose near the house, we never got any flooding. You can read that warning here. So, through drought or excessive rain, that one dam and others upstream from us, the first ones built along the once free-flowing Mekong, have the potential to play an important part in the daily lives of millions of people living downstream from it. Could China use that as a political weapon? Possibly, but I don’t think it has done so yet. 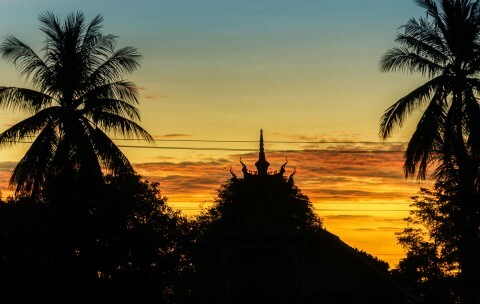 Laos is hosting the summit meeting of the Association of SouthEast Asian Nations (ASEAN) this year, which is quite an honor for the small country. The government has been tidying up the capital for the last several months, painting the lane markers on the roads so that they’re visible, putting up Christmas-like lights on the trees on the main roads and on government buildings, installing new traffic lights and making other less noticeable improvements. The importance of the meeting will be emphasized by the arrival of President Obama in the capital in September. I imagine security will be over-the-top, but I think our school will be on break at that time. 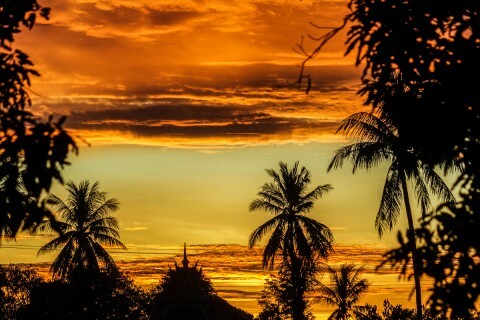 I might try to come into Vientiane while Obama’s there, just to record the scene. Already, though, there has been an increased security presence, with armed military and police patrolling the sidewalks along the main roads, something that was rarely seen in the recent past. I’ve noticed the increase especially along the road that runs next to the Mekong River, one I travel most days when I come to work. There have been groups of three armed (Uzis, AK-47s ??) military personnel meandering along the sidewalks, which are not normally packed with people. I don’t know what they expect to happen, but I assume they’re prepared for anything. They mostly look bored. When Obama arrives, I suppose most of the military and police will be present, or at least it will seem that way. Anyway, congratulations to Laos for being chosen to host this event. Here’s a better photo typical of the red sunsets and sunrises we’ve been getting due to the extreme haze lately, mainly caused by farmers burning the stubble off their fields. 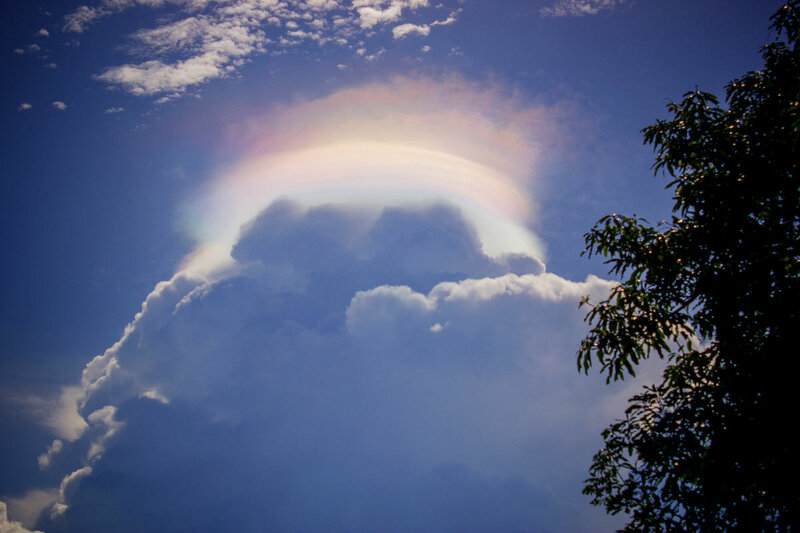 One of the Thailand news agencies reported that the haze has been caused by fires in Myanmar, Northern Thailand and Laos. I purposefully underexposed this photo to bring out the red in the sun. The color of the sun here pretty much echoes what I see at sunset and sunrise. I’m surprised at the number of different crops that are planted in the fields near my house. 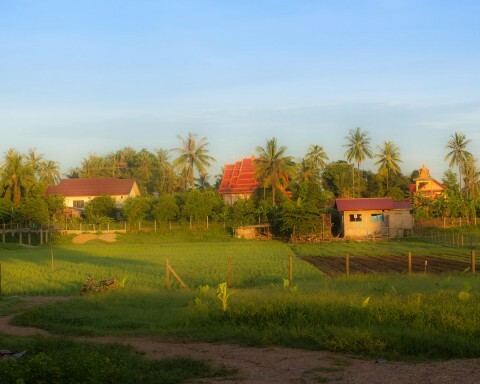 In the panorama photo below, you can see corn, marigolds (made into garlands and used in the Buddhist temples) and other crops (see the photo caption). 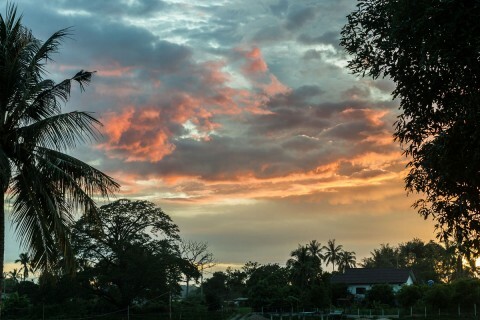 Right now, we’re in the dry season and it hasn’t rained since I don’t know when. Everything is very dry and the temperature is forecast to be above 100 F (39 C) for at least the next week, with no rain in sight. The house I’m renting is far enough away from the very dusty road that runs through the village that we don’t get too much of the dust. Along the road, however, almost everything is coated with a layer of brown dust. Whenever we do get any significant rainfall, there should be dancing in the streets. But, until then, how many of these crops are going to make it? 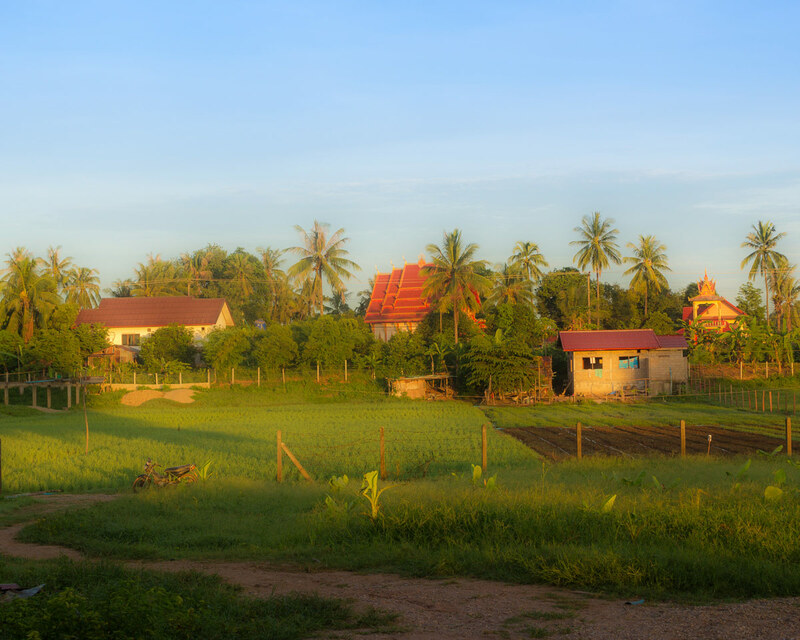 Most of the farmers here, near the Mekong, have wells that can be used to water the crops, but elsewhere, the dry season rice growers are having big problems with this drought. Hopefully, the rain will come sooner, rather than later. Some of the crops near the house. Starting at the left, from front to rear, are marigolds, an unknown crop (that’s really helpful, eh?) and corn. Then moving to the right, there is a crop of basil (I think) and another unknown crop. Then, there are a couple of fields, the front ready for planting and the back one with a plant just starting to come up. To the right is another corn crop, and in front of it is a hazy, green something. Again, not very helpful, but I’m not much of a plant and flower guy. Don’t forget the banana grove, also, in front. The banana grove that surrounds the house on three sides is growing and seems to be doing well. Hope it doesn’t block the sky later. And, you might notice the other farmland beyond the banana grove. Many more crops back there, too. I bought a pair of Olympus 10×50 binoculars on my trip to Bangkok back in December, primarily to use for star gazing. I got in a few nighttime sessions and was able to pick out some star clusters and galaxies that you don’t ordinarily see with the naked eye. However, I needed to get a tripod adapter to hook the binocs up to my camera tripod. I purchased one on my recent stay in the United States, so I was ready for steadier viewing. Unfortunately, the skies have been extremely hazy lately, mainly due to farmers around Southeast Asia burning their fields in preparation for another growing season. I can’t see the sun until way after sunrise as it tries to plow through the haze on the horizon. At night, only the brightest stars shine through the murk, which means that viewing those fainter cosmic sights is next to impossible. The only good thing about the haze is that it makes for some beautiful red sunsets. Guess I’ll have to wait until rainy season to get in some more good nighttime sky-watching. 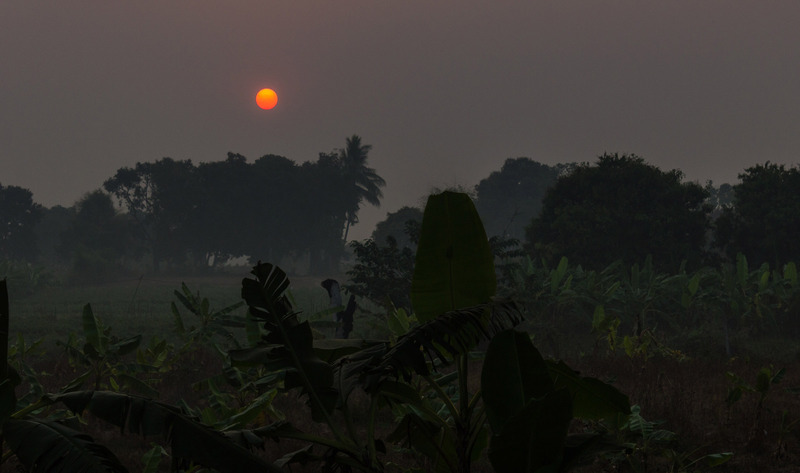 We’ve had lots of red sunsets because of the haze in the atmosphere. This photo was taken from a window in my house. The view isn’t great, but I’d have to walk or ride the motorbike quite far to get a better shot. 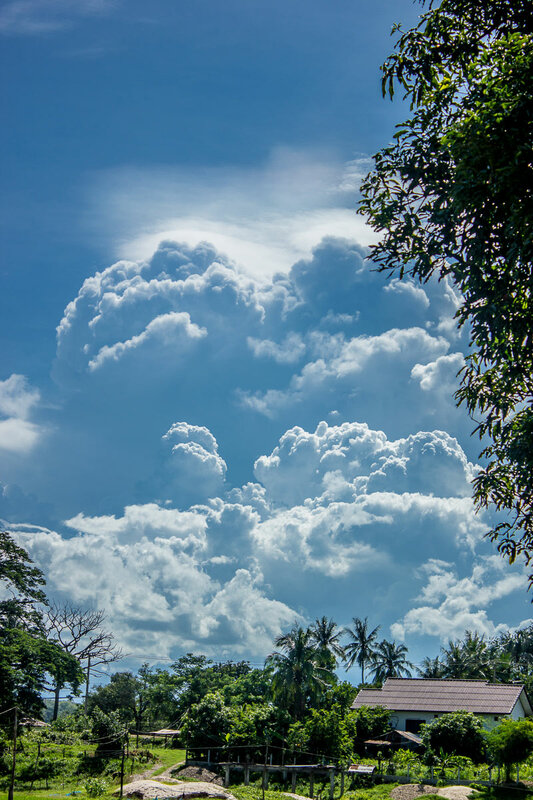 Since the heavy rainfall earlier in the month that led to flooding, landslides and a few deaths in other parts of Laos, we’ve had nothing but beautiful weather, with a few minor exceptions. Deep blue skies speckled with fluffy clouds have been the order of the day. A few rain showers have interrupted the nice weather, but it’s like the rainy season has ended, though that’s not what the forecasters called for back in June, in the middle of a drought. Then, the meteorologists were predicting that we would have an abundance of rain through September and into October. That still may happen, but right now we’re enjoying the nice weather. 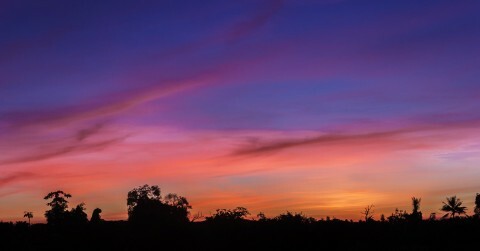 There have been many nice sunrises and sunsets during this dry spell, so here are a few photos. I’ve even managed to include some from around 5:15 or so in the morning. Yes, I’ve actually managed to get up early enough to watch the sun come up. I leave my camera on the tripod overnight so it’s ready to fire off some photos first thing in the early dawn light. There are also some views of a storm cloud that appeared to be bringing some heavy weather, but it fizzled out before it reached us. P.S. Had to post this very quickly this morning while my internet connection was still relatively fast. I can almost always get a connection, but most of the time it’s very slow. Sunset, August 16, 2015, behind the temple on the road that runs through the village. Unfortunately, those power wires that interfere with the photo are very difficult, for me, to take out with Photoshop. I probably could have eliminated them with some time-consuming editing, but, oh well…..
Sunset, August 16, 2015. The small area between some trees is pretty good for taking photos of the sunset, except for the small branch in the upper right which protrudes into the shot. It’s high enough on the tree that I can’t pull it off. 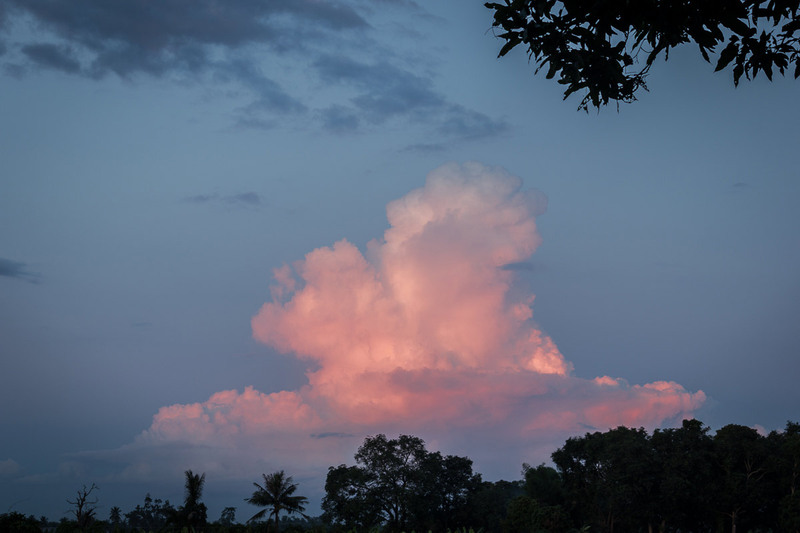 Pink cloud highlighted by the setting sun on August, 16, 2015. Storm cloud, August 16, 2015. The Cloud King. Storm clouds, August 16, 2015. I spent a few days in Vientiane last week just to goof off and walk around a bit. 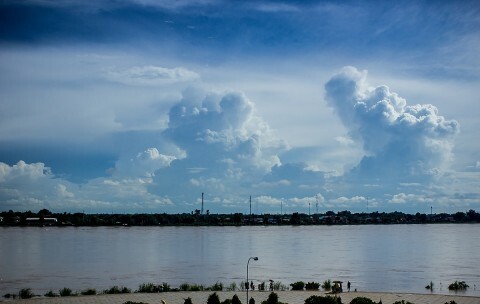 The big story was how much the Mekong had risen since my last day of work on the previous Saturday. That weekend very heavy rains had affected most of the country, launching devastating landslides and flooding tributaries. 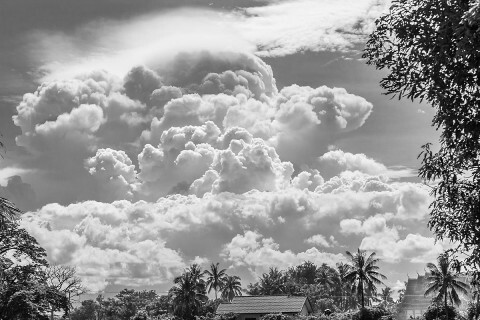 This was a small portion of what hit Myanmar and India, and it caused “only” a few deaths. However, all that water had to go somewhere, so the Mekong rose dramatically. 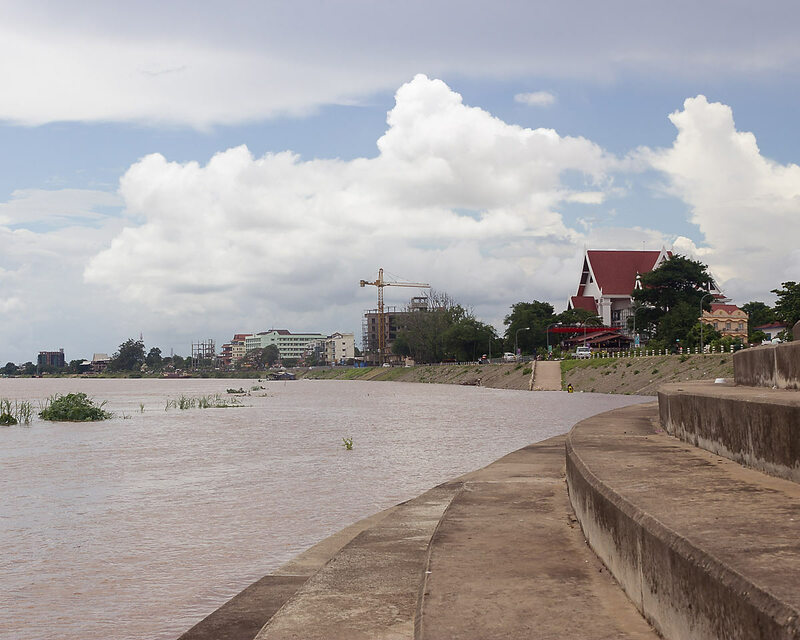 I read in the Vientiane Times on Friday that the river would crest in Vientiane on Saturday, the 8th, just below flood level. 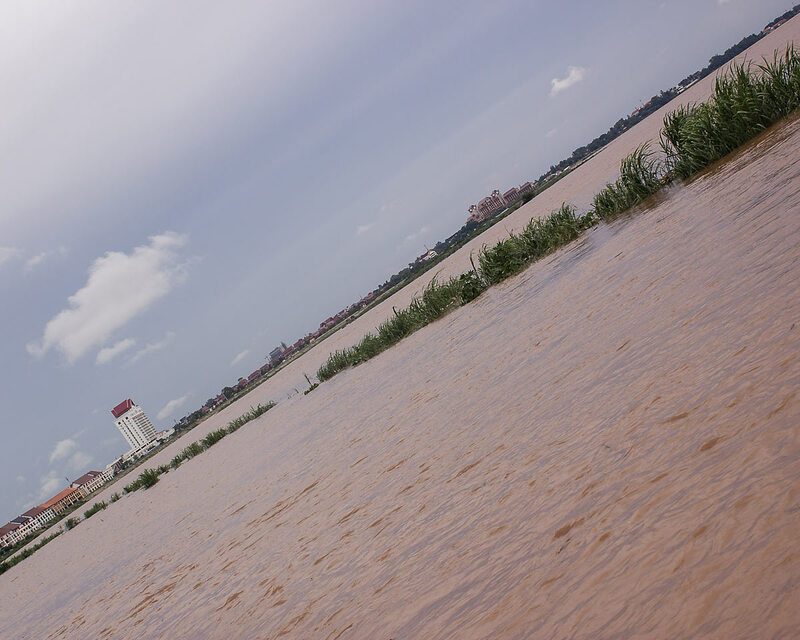 Some low-lying, non-embanked areas of Hadxaifong district might see some flooding, the article stated. So, guess where I live? Yup, Hadxaifong. With a lot of trepidation, Nai and I returned to the house on Saturday, but, thankfully, there was no flooding. The island marker that I use to see the height of the river was still above water. Last year, it had been submerged for a week or so, and there had been no flooding in our area. For the past five or six days, we’ve been enjoying beautiful weather. The rain has stopped and the skies have been clear to partly cloudy, with lots of sun and high temperatures. That should keep the river down, unless there’s a lot of rain upstream, which isn’t in the forecast for now. Everything has dried out, and it’s like we’re in the dry season again. I’m sure there will be plenty more rain to come, though. Here are a few photos of the Mekong and Vientiane. This is a photo taken on Wednesday, August 5th. To the right is what remains of a sand sculpture that was made for the Laos New Year back in April. It’s the largest one among five still standing. There are four smaller ones to the left, out of range of this shot. It’s a sculpture of an elephant. During the dry season, the main channel is about 15 meters beyond the sculpture and many people walk out there. This was taken the day after the previous photo. In the lower right corner, above the street lamp, you can see that the elephant sculpture has disappeared (washed away, I believe) and the river has risen higher on the tuft of scrub brush. The next day, the scrub brush would be under water. 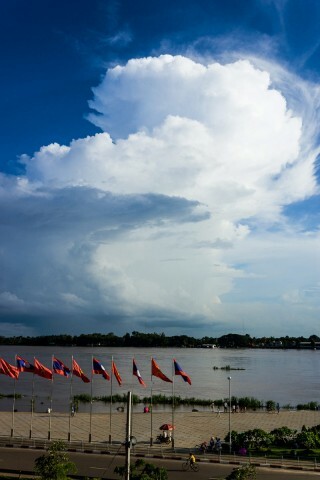 The impressive storm cloud moving over Thailand stayed on that side of the river. Looking toward the Don Chan Palace Hotel, the tall building on the left, from the riverfront promenade. Looking north along the promenade. Soon, above the steps, crowds of people will gather to walk, ride bicycles, do aerobics, jog, and just hang out. Hopefully, the river will stay where it’s at. 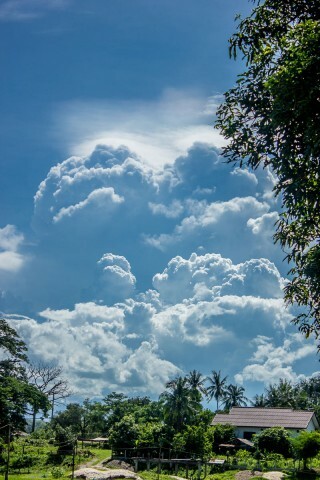 Some nice clouds over Thailand above a near- flood level Mekong River.